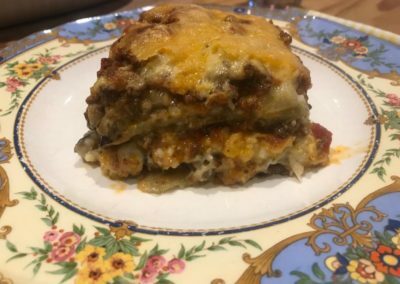 Every now and then a recipe comes along that you just have to print and keep, bookmark or do whatever you need to so that you do not lose it and this old fashioned Lasagna recipe is one of those easy recipes. 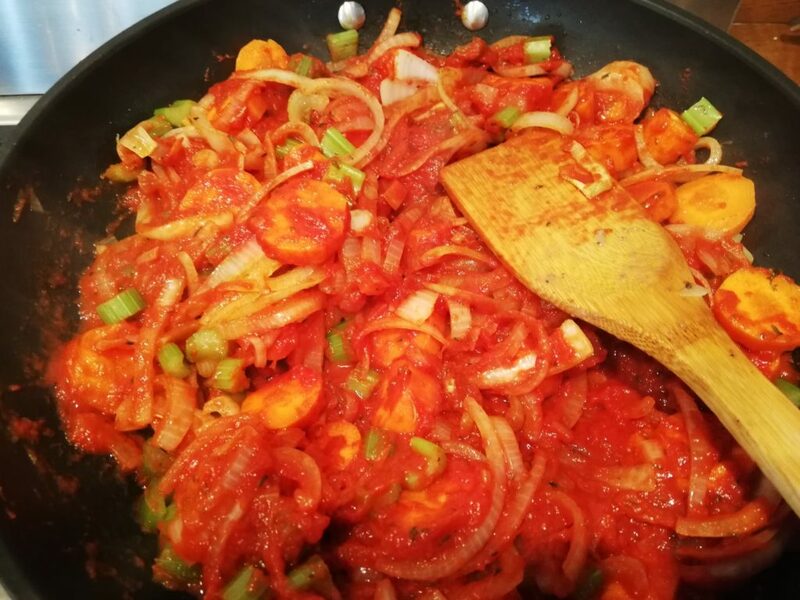 Don’t be put off by the number of ingredients, you will have most of them in your cupboard. 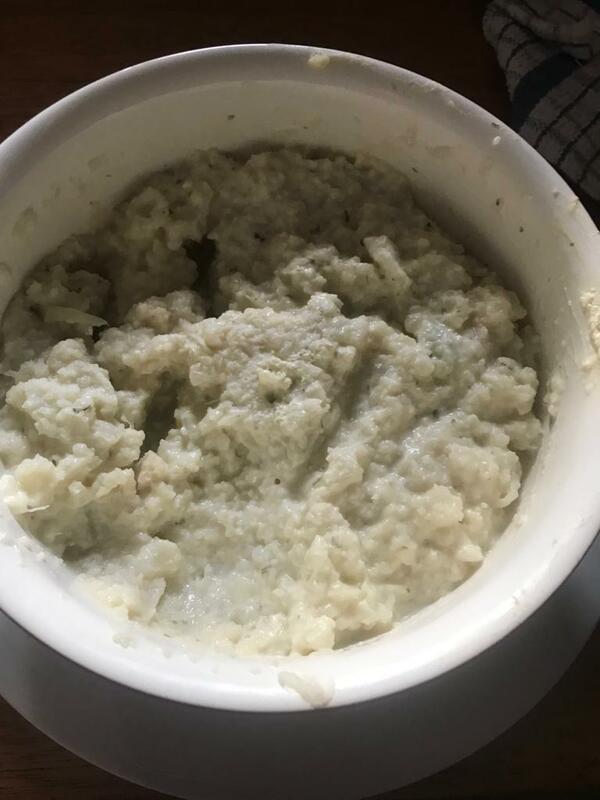 There is no low fat low salt this or that, it’s from a great friend of mine whose grandmother passed on the recipe and has been a favourite in their household for as long as anyone can remember. This is not to say that it is difficult or complicated, it is a lasagna recipe that is unpretentious, great tasting and home style food at it’s best so do what you need to and cook this one, you will be so glad you did. (serves 6) Dish size is 30cm x 20cm x about 8cm deep. If you are using boxed lasagna, boil the kettle and fill a dish with boiling water, place your lasagna sheets into the water one at a time and allow to stand for about 10 minutes or so so that they par cook. It is important to add them one at a time or they will stick together. In a pan on a medium heat with a little oil add the onions and cook until they begin to sften, about 3 or 4 minutes. Add the pork sausage meat and fry for about another 3 minutes. 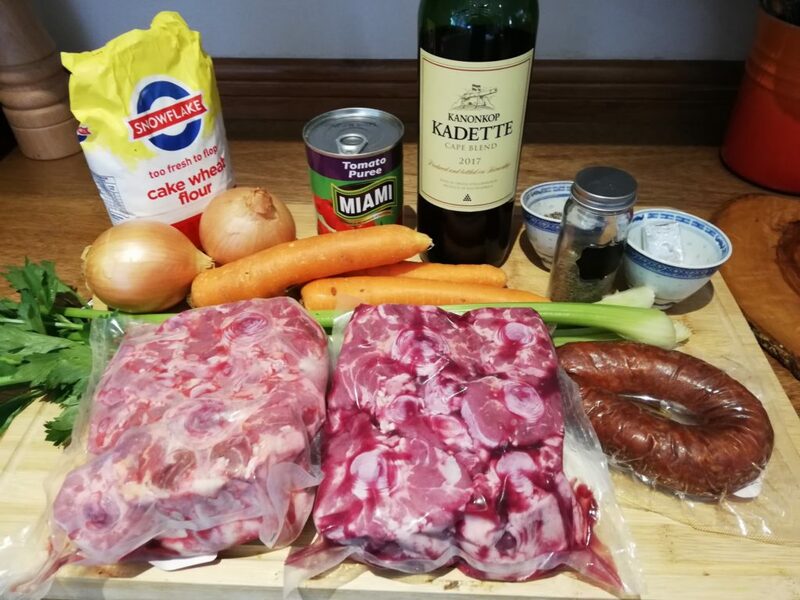 You want to make sure that the meat is separated into a mince consistency. Add the beef mince and cook for about 10 minutes, moving it around so that it is all cokked. It may look a bit grey at this stage but have no fear that is how it is meant to look. 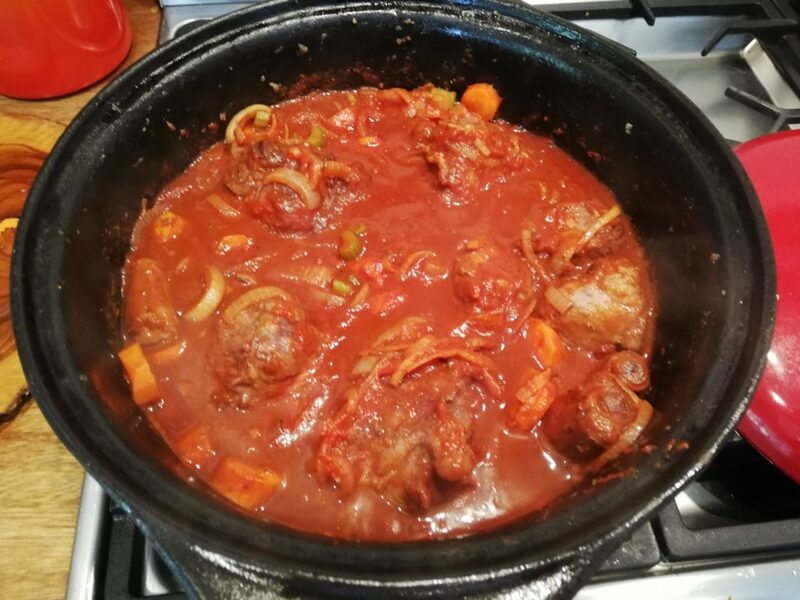 Now add the tomato puree, tomatoes, beef stock and oregano, mix it all up and allow to heat through, taste and season with salt and pepper and then leave it to simmer for about 30 minutes or so to reduce the liquid and thicken up while you make the white sauce. Take a small pot and place on a medium heat, melt the butter and then stir in the flour. You want the flour to cook but not brown so make sure you are tirring all the time and that your stove is not too hot. This should take about 3 minutes with the butter and flour mixture foaming. Now add the milk little by little and stir furiously to get a smooth consistency and you ahve used all of the milk. Now add the nutmeg, give it a good stir and turn off the heat. By this time your meat sauce should be ready as well and you are ready to get going. Take a 20x30cm oven proof dish that is at least 6-8cm high and give it a light rubbing with some butter all over the base and add a thin layer of the meat sauce, then a layer of lasagna sheets, a thin layer of white sauce, a sprinkle of parmesan, then another layer of lasagna sheets and repeat until it is all finished. 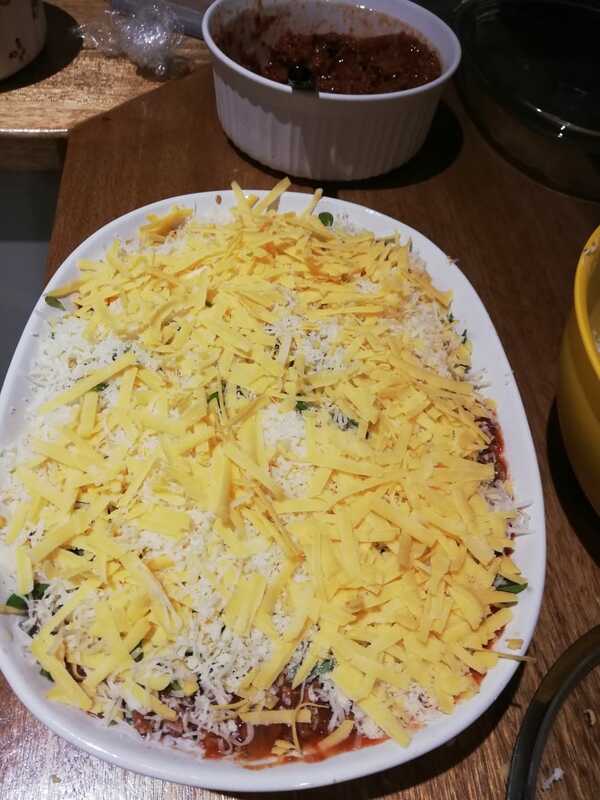 Sprinkle a nice thick layer of Mozzarella over the top with another fine sprinkle of parmesan. Into a 180 Celsius oven it goes for 40 to 45 minutes or until the top is beautifully brown and bubbling. 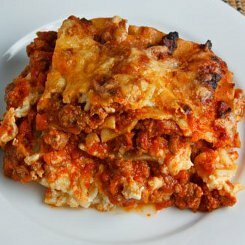 That is the very best lasagna you will ever taste! 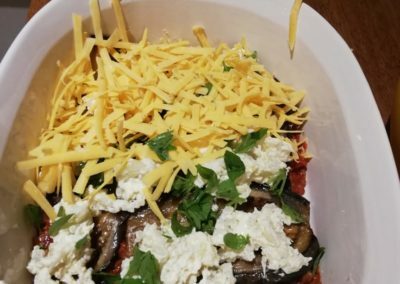 Check out some of the other easy pasta recipes. 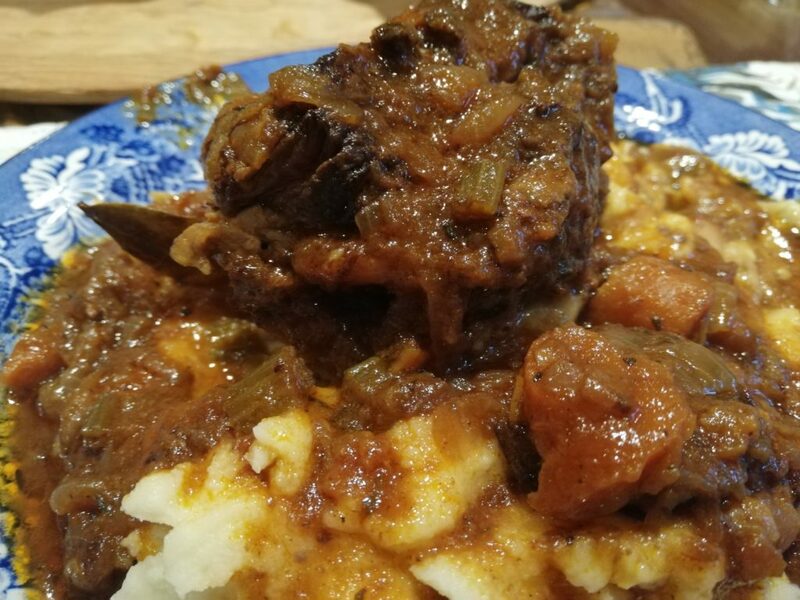 Beef short ribs are the ideal replacement for lamb shanks. Not only are they so tasty they are also quite affordable. Don’t be put off by the sinew and fat in the cut; they disappear when cooked in the wine and stock. 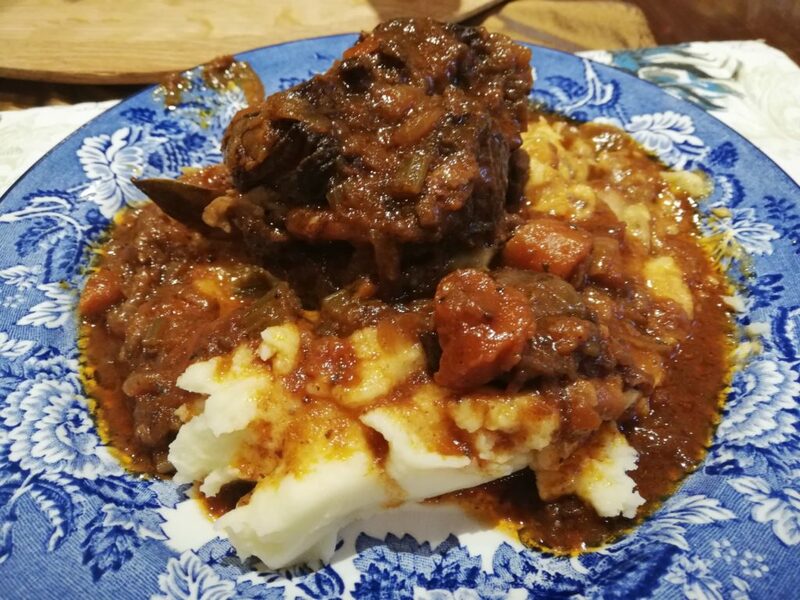 The end result being a tender mouth watering dish that your friends and family will be talking about for a long time. Season the short ribs well. Pour some olive oil in a deep-sided roasting pan. Place the pan on a stove plate and brown the meat on all sides. Add the garlic and the tomato puree and heat for a minute or two. Pour the red wine into the pan and scrape the bits at the bottom loose. Boil for 10-15 minutes until the liquid is reduced by half. Pour in the beef stock and bring to the boil while continuously basting the ribs. Cover the pan with foil and place into the pre-heated oven. Bake for 3-4 hours until the meat is tender and falling away from the bone. Keep basting the ribs every now and then. Be sure to check the liquid in the pan at the same time so that it does not cook dry. Just add water when needed. About 10 minutes before the ribs are ready to come out, fry the bacon bits and mushrooms until tender. 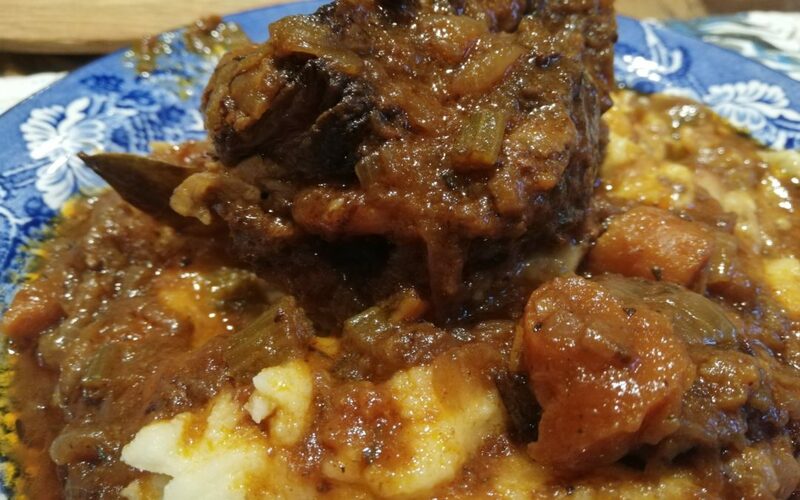 When the short ribs are ready, take out of the oven and place them on a serving dish. 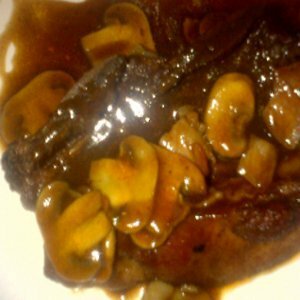 Place the pan with remaining gravy on the stove plate and add the mushrooms and bacon. Bring to the boil. You can add a small amount of maizena to thicken the sauce if it needs to. Serve the ribs topped with the gravy. Anyway, the dinner was a real hit, Prime rib roast, melanzane (they literally raved about it) and a potato bake with mushrooms that also got rave reviews to almost embarrassing proportions. So if you want a real winner, these are the recipes. (I laso served a few gem squash topped with cheese. (It’s not the healthiest meal bu man it was delicious! 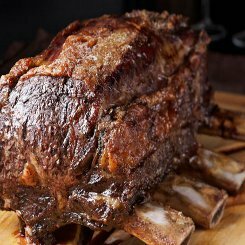 A tip: When you select your prime rib ask the butcher to cut through the bone at the base so that you can easily cut the portions, I got mine from Pick n Pay on William Nicol near Parkmore and the butchery was very helpful. Stuff a few stalks of Thyme into each cut at the base of the roast cut by the butcher. 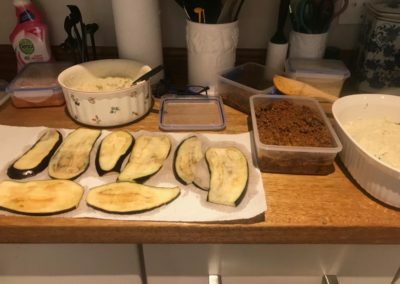 Turn it over, place on a roasting dish that is covered with tin foil (makes cleaning simple) and then use a generous coating of ground salt and pepper to cover the meat. Place in the oven for 1 and 1/2 hours. This will give you medium and medium rare on the end 2 portions and rare portions in the middle. To make the thyme butter, soften it in the microwave for about 20 seconds, add the chopped thyme and add a grind of black pepper and salt. Mix it up and then place on a piece of cling wrap. Roll it up and twist the ends until it is tight. Fold the ends and then pop in the fridge to harden. Cut a slice of herb butter and place on top of each persons meat. 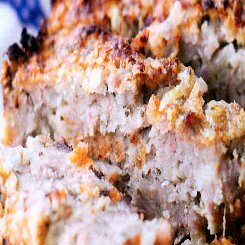 The mixture of pork and beef with a hint of sage in this meatloaf recipe is something quite marvelous. I am a big fan of meatloaf, it’s cheap, makes a great easy dinner and is fantastic on sandwiches. 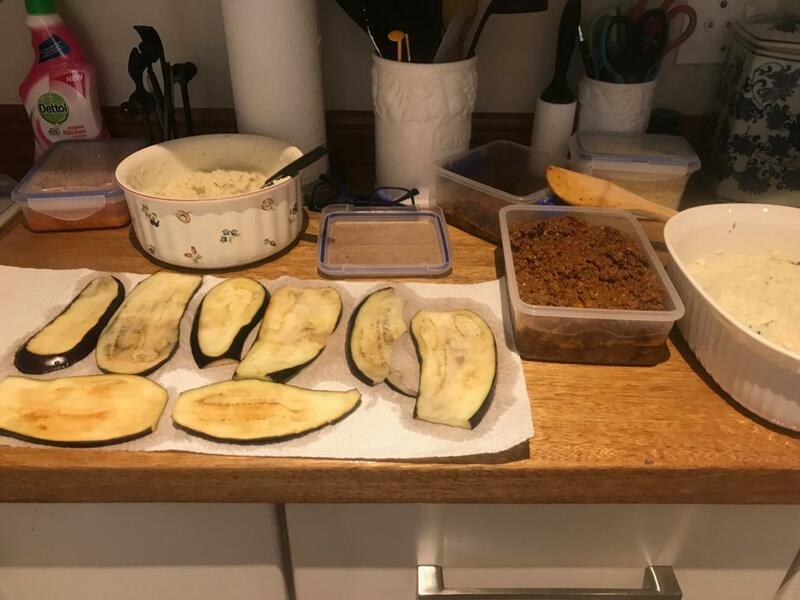 It’s really important to use extra lean mince especially with the pork and to keep it nice and moist either put a bowl of water in the oven when cooking it or put the loaf tin in a roasting pan with some water in it. Prepare a baking tray or small loaf tin(17cmx11cmx8cm) by smearing it with a little oil and heat your oven to 180 Celsius. 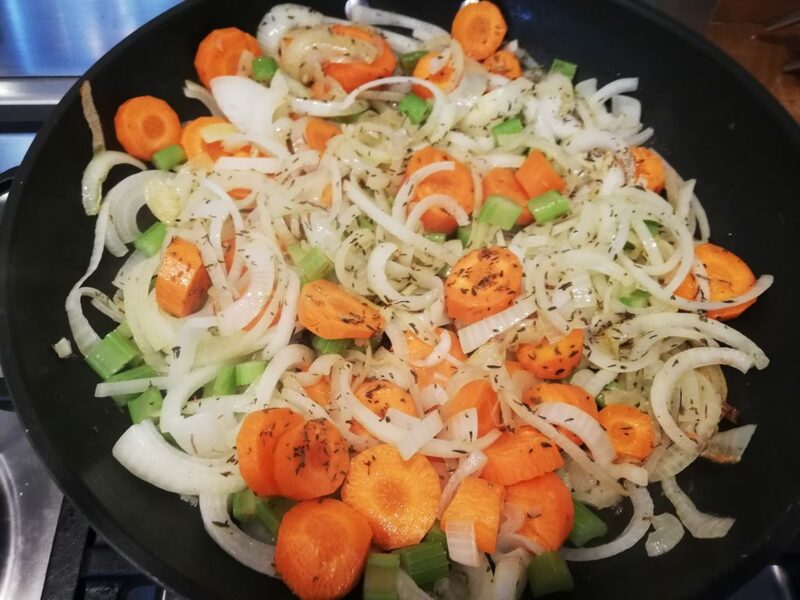 In a pan on a medium heat add the onion and carrot and cook for about 3 or 4 minutes until it begins to soften, add the garlic and cook, stirring every 30 seconds or so for another 3 or 4 minutes. Now add the sage and give it a good mix through and then remove from the pan and place into a large mixing bowl. 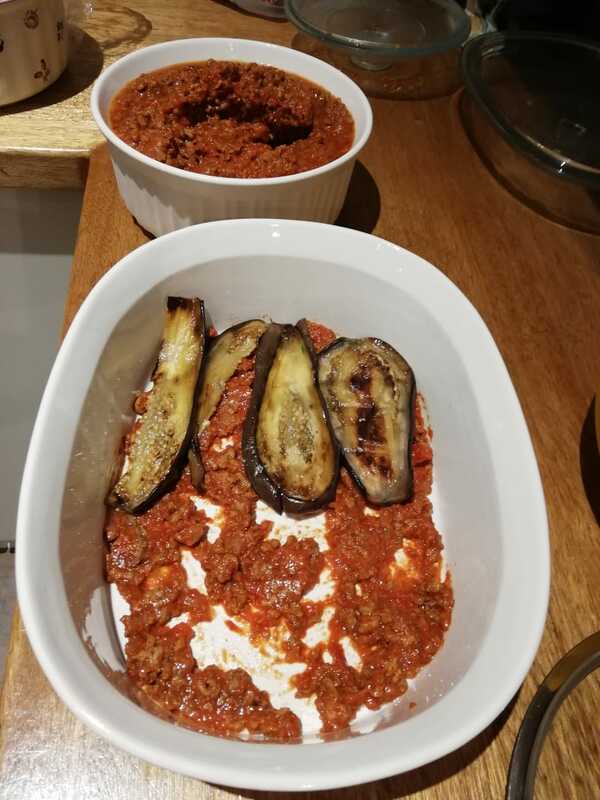 Add the pork mince, beef mince, breadcrumbs, tomato puree, Worcestershire sauce and the mustard if you decide to use it. Now get you hands in there and mix it well to evenly distribute all of the vegetables. Give it a light seasoning with a bit of salt and black pepper and then a final mix. If you are using a baking tray, place it into the center of the tray and form into a loaf shape or place into your loaf tin and pack it down quite well. Place in the oven with an oven proof bowl containing about 500ml water. Bake at 180 Celsius for 45 minutes until the loaf is firm. If you are serving it hot, allow it to cool slightly for about 5-10 minutes before turning out and slicing. Serve with peas and mash or any of your favourite vegetables. 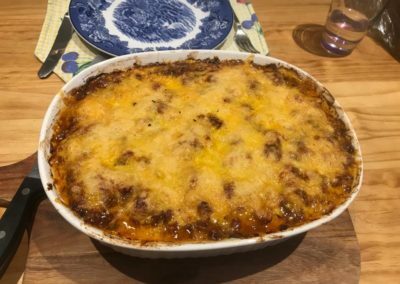 Here is a more traditional meatloaf recipe with tomato sauce topping. Heat your oven to 200 Celsius while you prepare, it is very important to place the dish in a hot oven. 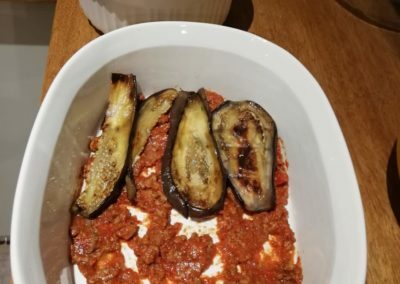 You can use a metal roasting pan or an oven proof dish for this recipe that should be something close to 30cm x 20cm and have sides at least 7cm high. 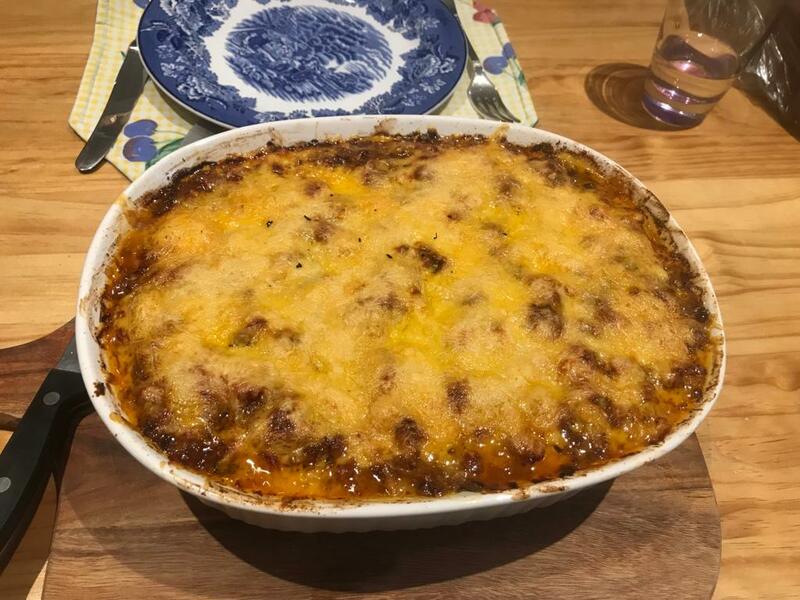 Add the oil to your dish or pan and arrange the sausages in the base, place in the oven and bake for 10-15 minutes to cook the sausages while you prepare the Yorkshire pudding recipe. I cannot emphasis enough how important it is to get good quality sausages, some sausages have way too much fat in them and shrink down to these little tiddlers. 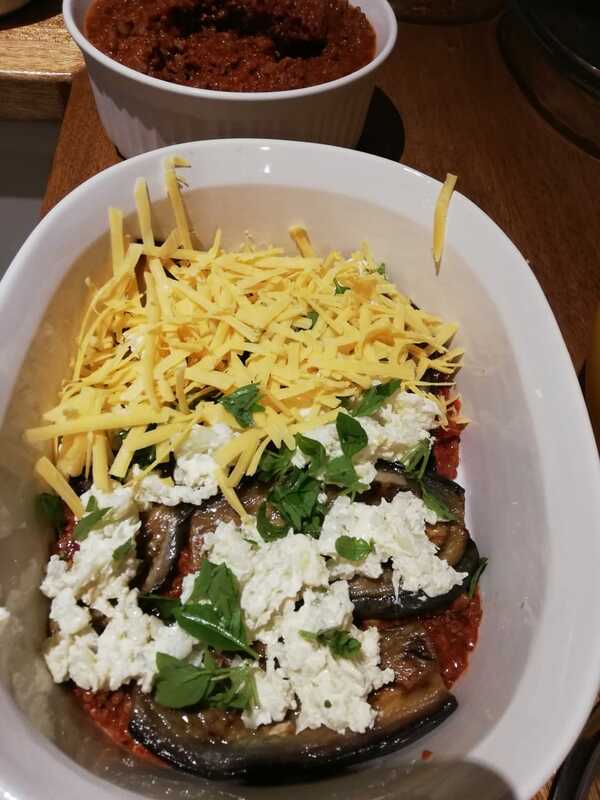 In a mixing bowl, add the flour, 3/4 of the milk and eggs, whisk it to a smooth consistency and then add the last of the milk in 2 portions mixing well between each addition. 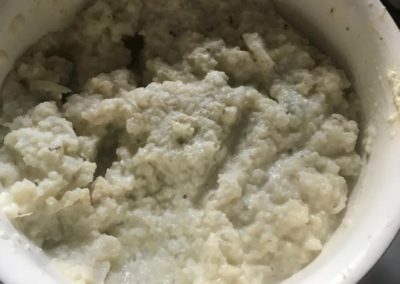 You will have a nice smooth, quite runny consistency. Season with a little salt and white pepper, give it a final whisk and transfer to a jug. Take the sausage out of the oven and with tongs or a fork, move them around a bit so that none of the sausages are stuck to the bottom and try to leave equal spaces between the sausages. Now slowly pour the mixture in between the sausages so that they are almost covered. Return to the oven for about 40 minutes and watch the Yorkshire pudding rise. It will rise above the edge of the dish. Check after 35 minutes or so to ensure that it does not burn. 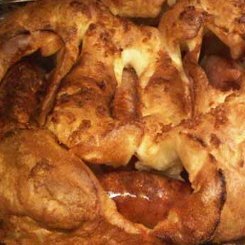 The Yorkshire pud should be a deep brown. puffed up and the sausages should be partly visible. Serve straight away with a nice gravy. 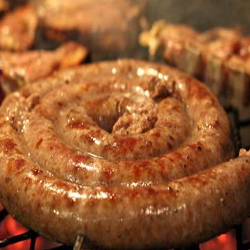 There is no reason why you could not use chicken sausages if you are averse to meat! Carpaccio is a perfect hot weather starter and a few weeks ago I made it for a dinner party along with the Eton Mess as a dessert and it went down so well I will be doing it again and again. The main was a slow roasted pork belly done by a mate of mine who is legendary with pork. Cover a chopping board with a nice layer of salt, pepper and sprinkle of paprika. Roll your fillet over the salt mixture giving it a nice coat all over. Heat a little vegetable oil in a pan to very hot and sear the fillet so that the entire outside is beautifully golden all over. Remove it from the heat and let it cool for about ten minutes. 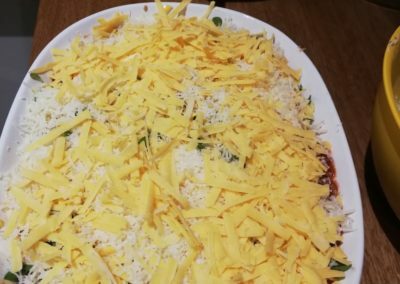 Now wrap it up tightly in some cling film and pop it into the freezer for about 2 hours or until about 15 mins before you are going to serve. When you are ready to serve take it out of the freezer and set it aside while you prepare the platters by tearing the greens and placing the tomatoes all over the platter. 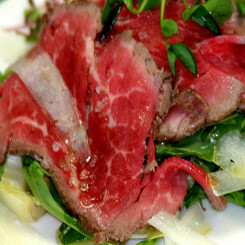 Now unwrap your fillet and with a very sharp knife cut thin slices and place them all over the greens. Now take your parmesan and with a potato peeler slice up a whole lot of thin pieces and place them on top of the carpaccio. Drizzle generously with olive oil and give the whole platter a good grind of black pepper and salt. For something really special get a bottle of capers in brine and sprinkle a few over the top. It’s really yummy folks, give it a go on a special occasion. 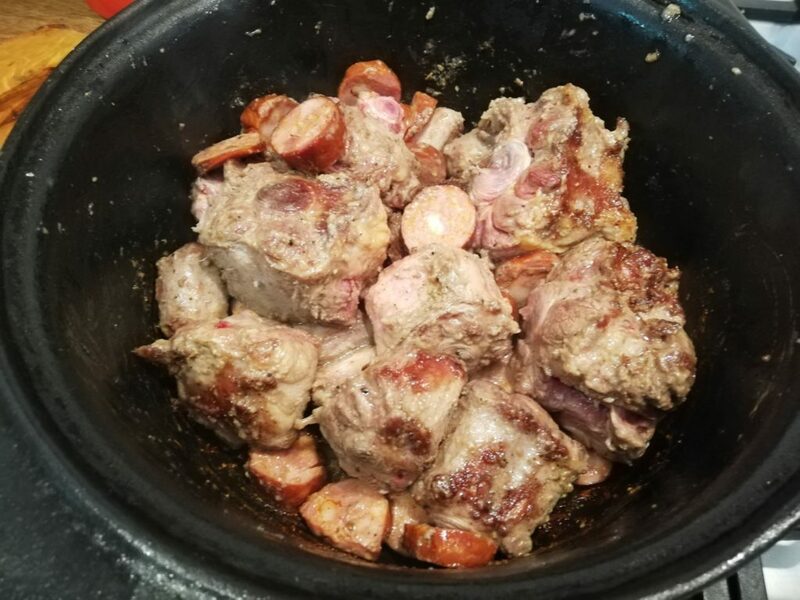 This is a super quick, delicious meat dish that you will use again and again. 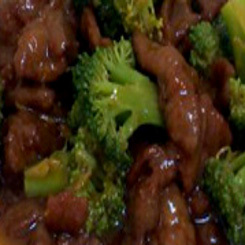 Chinese food is generally very quick, easy and healthy and this one is no exception. It’s a fabulous week night meal that takes just minutes to make. I really love Chinese food and this one, along with the egg fried rice and sweet and sour pork are real favourites of mine. Good for 4 people. Remove the fat from the steak and slice into thin strips across the grain, this is really important or your steak strips can get tough. Heat a wok/frying pan to very hot, add a little oil and fast fry the steak for about 2 – 3 minutes in 3 batches tossing them around so that they do not stew. You want them to sear on the outside but not cook completely, remove and set aside. Now add the broccoli, spring onions, ginger, garlic and stock that has had the corn flour mixed into it and simmer covered for about 3 minutes. Mix the soy sauce,sherry and sugar together and add to the veg mixture. Add the beef back to the mixture and cook for another 2-3 minutes giving it a stir from time to time. That’s that, you are done. Serve it with egg fried rice or chinese egg noodles for classic Chinese food.